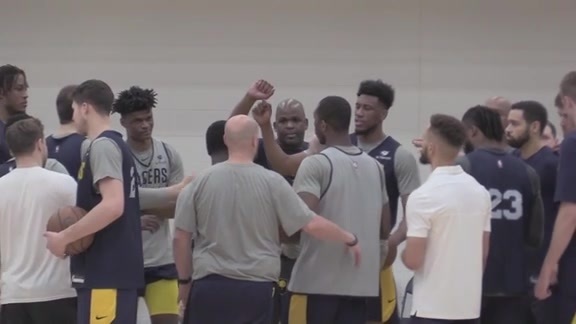 Pacers Preparing for "One Last Dress Rehearsal"
April 9, 2019 - With their playoff seed and opponent already determined, the Pacers discuss their approach heading into Wednesday's regular season finale in Atlanta. The shouts and squeaks of the fullcourt scrimmage seeping through the closed doors at the St. Vincent practice facility were indication of a spirited practice session. Later, the smiles and conversation between players as they closed practice with shooting drills were indication of a spirited mood. The Pacers didn't play well in their previous two games, losing by 20 and 12. They've also dropped nine of their previous 12 games heading into Wednesday's regular season closer at Atlanta. And yet they appear to be energetic and confident about the weekend's playoff opener in Boston, regardless of what happens against the Hawks. 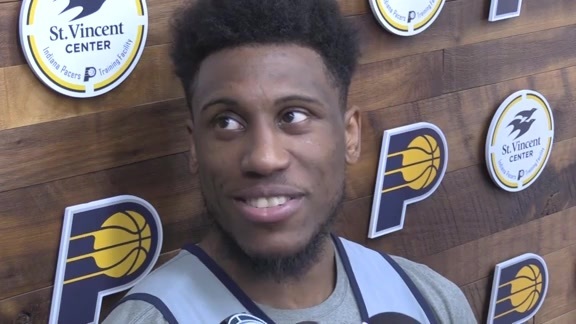 It would be highly unusual for an NBA team not to be professing a positive attitude in such a circumstance, but the Pacers generally have backed their upbeat words with upbeat actions over the course of a season in which they've surpassed general expectations. They're relying on that now, looking past the losses to the Celtics on Friday and to Brooklyn on Sunday to focus on their entire body of work. "Why wouldn't we be?" Darren Collison said when asked why the Pacers should be confident when the playoffs begin. "We had a good year. It's been a tough year in terms of injuries, but playing without our best player (Victor Oladipo), without our All-Star, and still having 47 wins, that's amazing. Everybody should feel good about themselves." And so they do, it seems. But they also know they have plenty of improvements to make from their weekend losses if they are to legitimately contend with the Celtics, who were regarded by many as the second-best team in the NBA behind Golden State when the season began. It starts with health. Collison, who missed three games last week with a groin strain, was a full participant on Tuesday. He had shown plenty of rust in Sunday's loss to Brooklyn, when he hit just 2-of-12 shots, but said he's nearly full strength again. His backcourt mate, Wesley Matthews, was the only player to be held out of the practice, but was lively while shooting with teammates at the end of the workout. 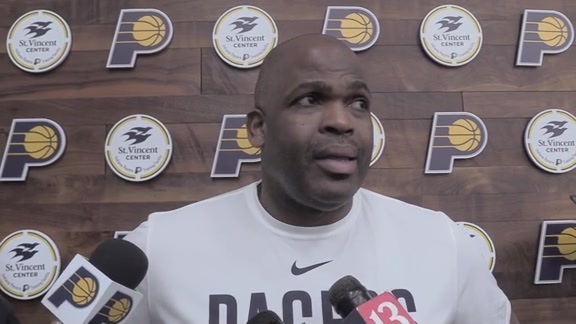 McMillan indicated after Sunday's exasperating loss to the Nets that he might hold some players out of Wednesday's game, whether they like it or not. Three Pacers – Thad Young, Bojan Bogdanovic and Cory Joseph – have played all 81 games and are healthy enough to achieve the point-of-pride distinction of playing in an 82nd. McMillan said Tuesday he wasn't sure if he would hold anyone out of the game in Atlanta, preferring to wait to talk it over with his coaching staff and the players in question on Wednesday. "I want to see how guys came out of practice today," he said. Young, who played in every game last season until he was held out of the season-ender as a precaution, doesn't care either way. "Whatever they see fit to do, I'm happy with it," he said. "Playing 81 or 82 games doesn't matter to me." What should matter most to the Pacers now is defense. They've lacked it lately. Although they still rank third in the NBA in overall defense, they have faltered in that half of the game, particularly in transition. Failing to get stops means taking the ball out of the net, which means failing to get easy scoring opportunities, which means trying to extract baskets from a sluggish halfcourt offense. Ball movement and pace are concerns, too, as they often have been this season. Basically, though, it's a matter of forgetting fast and remembering what worked in the past. Collison said he and Young have been talking privately in person and on the telephone with one another and with teammates about "little things" to bring about improvement. Given those conversations, the day off on Monday and Tuesday's live-action workout, he believes the reset is complete. "We're on the right track now," he said. "I wouldn't look at the last game (against the Nets) as any indication of where we're at. "A lot of times when you lose two in a row you start to forget your identity as a team, but today's practice we kind of got back to that." Tuesday's practice was more about preparing for Boston than Atlanta, but some of what the Hawks do offensively is similar to the Celtics' offense. Atlanta is lottery-bound at 29-52, and has improved over the course of the season. It has won six of its previous eight home games, with victories over Philadelphia (twice), Milwaukee and Utah. The outcome of that game won't matter much to the Pacers, particularly if rotation players are held out. What will matter is "playing good basketball," from McMillan's viewpoint, and getting ready to work the weekend. 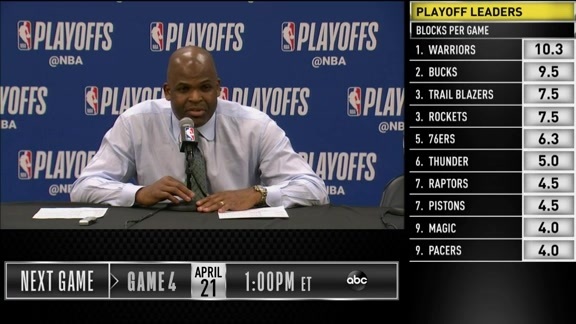 "I don't think a lot of people will be picking us to win that the way we've played against Boston," McMillan said. "But that's been the talk about us all season long. It's a new season. You forget the regular season record and all of that and you take it one game at a time."